The following explains points to be checked before exporting in a file format, and how to use the exporter to export in each file format. To add a chapter, make sure that a sequence marker is set in a desired position. *2 Not supported on EDIUS Pro. *4 For QuickTime, depending on the environment of use, available codecs vary. *5 To load medium where a file has been exported to the camera, perform [Restore Media] on the camera. Thumbnails cannot be displayed on the camera. *1 It is disabled by using the Dolby Digital Professional license. *2 It can be supported on EDIUS Elite/Pro by using the Dolby Digital Professional option. Exporter settings can be registered as a preset. Conversion settings used to export in a format that differs from the exporter settings and the project settings can also be registered in combination with the exporter settings and project settings. Once registered, a preset exporter can be easily called upon. You can select the file format to export in, allowing for export in various formats. Exporting in the Windows Media Video format. 1Click [Export] on the Recorder. The [Print to File] dialog box appears. Click [File] on the menu bar, and click [Export] → [Print to File]. 3Click [Windows Media] on the category tree. A list of exporters is displayed in [Windows Media]. 4Click [WindowsMediaVideo], and click [Export]. The [WindowsMediaVideo] dialog box appears. 6Enter a file name, select the save destination and click [Save]. After step 3, the procedure differs according to the selected exporter. Perform operations according to the on-screen instructions. Select a category to narrow down the exporter options. Display exporters in a list in the order of most recently used first. Display the preset exporters registered by the user in a list. Display all exporters in a list. You can narrow the exporter options by selecting a category by format. Display the exporters within a selected category in a list. Display preset exporters stored as default and preset exporters stored by the user. Indicates exporters to export a file that includes a video element. Indicates exporters to export an audio element. Check [Enable Conversion] to display all preset exporters including preset exporters with a format that differs from the project settings. Check this item to enable conversion processing used to export in formats that differ from the project settings. Check this item to export with a timecode shown on-screen. Check this item to export in 16 bits/2ch regardless of the audio format of the project settings or selected preset exporter. Convenient to leave checked when exporting a multi-channel project to be used with another company software. Displayed only in the stereoscopic edit mode. Select the format of stereoscopic processing from the list. Selectable items differ according to the selected exporter. [L/R Dual Stream] exports the video of the L and R sides to a single dual stream-compatible file. [Left only]/[Right only] exports video of the L or R side only to a single file. [Side by Side]/[Top and Bottom]/[Line Interleave]/[Blend]/[Anaglyph]/[Difference]/[Split Grid] combine and output the video of the L and R sides to a single file. [Separate L/R Clips] outputs the video of the L and R sides separately to two different files. Click the expand button to configure conversion processing when exporting in a format that differs from the project settings. Select an exporter in the exporter/preset list, and click [Save as default] to save the settings in [Current default]. Select [Default Exporter(Print to file)] from [Export] on the Recorder to select the saved default exporter easily. Register the exporter selected in the exporter/preset list together with the conversion processing configured under [Advanced] as a preset exporter. Delete the preset exporter selected in the exporter/preset list. Export the preset exporter selected in the exporter/preset list. Add the specified range to the batch list. To export a multi-channel project to use with software by another company, either check [Export in 16bit/2ch] or select an exporter in 16 bits/2ch audio format. [CBR] is a fixed transfer mode. It encodes with a constant bitrate regardless of movement or image complexity. Enter a value for [Bitrate]. [CBR (2-pass)] performs encoding after an analysis for movement and image complexity. [VBR (quality based)] is a variable transfer mode of direct conversion. The allotted bitrate is varied according to movement and image complexity. Enter a value for [Quality]. [VBR (2-pass)] is a variable transfer mode. The allotted bitrate is varied after an analysis of movement and image complexity. Enter the average bitrate in [Bitrate], and maximum bitrate in [Max]. Check this item to change the frame rate (1-60 fps). To set to 29.97 fps, enter “2997”. The image size can be set by selecting from the list. Checking [Square pixel] sets the image aspect ratio at 1:1. Check this if the video is made vertically long or horizontally long by the playback device. Move the slider depending on the relative importance of [frame rate (0)] (prioritizes smooth movement) and [image quality (100)]. [CBR] is a fixed transfer mode. It encodes with a constant bitrate regardless of audio complexity. Select a bitrate from the [Bitrate] list. [CBR (2-pass)] performs encoding after an analysis for audio complexity. [VBR (quality based)] is a variable transfer mode. The allotted bitrate is varied according to audio complexity. Select an average bitrate from the [Quality] list. You can use an exporter to export to file in a format that differs from the project settings. 3Click a category in the category tree, and check [Enable Conversion]. All exporters and preset exporters where the export format differs from the project settings are displayed. Preset exporters where conversion processing is performed will have a “→” symbol on their icon. 4Select an exporter, and click the expand button in [Advanced]. Preset exporters stored as default can also be selected. The [Print to File] (Detailed Settings) dialog box appears. 5Set the details of the format to be exported. When you click [Save as default], the current settings are saved and you can select an exporter simply by selecting [Default Exporter(Print to file)] from [Export] on the Recorder. You can save the current settings as a preset. 6Click [Export], and configure according to the on-screen instructions. 7Enter a file name, select the save destination and click [Save]. After step 6, the procedure differs according to the selected exporter. Perform operations according to the on-screen instructions. If a preset exporter was selected in step 4, you will switch to the export format settings of that preset exporter. Checking [Change Video Format] exports files converting to the video format set in the following items. “*” in the right field of a setting indicates that the setting agrees with the project settings. Display a list of commonly used video formats. When you select a video format from the list, [Frame Size] and other items will switch to the selected video format settings. Select a frame size from the list. Select [Custom] to enter a setting value in pixels. Select an aspect ratio from the list. If you select [Custom Display Aspect] or [Custom Pixel Aspect Ratio], you can set the aspect ratio by entering values. If you have set a customized aspect ratio, make sure to select a conversion method from the aspect ratio conversion setting. If the aspect ratio set in [Aspect Ratio] differs from the project settings, select which method to use to convert the aspect ratio from the list. Check this item to convert the aspect ratio after cropping with the overscan size. The overscan size differs according to the project settings. Select a frame rate from the list. If you have set a customized frame rate, be sure to select a conversion method in the frame rate conversion settings. If the frame rate set in [Frame Rate] differs from the project settings, select from the list which conversion to perform. If you select [Frame blending], supplemental frames will be interpolated by combining the frame before and after each supplemental frame. If you select [Nearest frame], the nearest frame will be used to make supplementary frames. Select a field order from the list. If you select [Auto], the optimum perceived field order will be selected automatically. Select whether the video to be exported displays the drop frame timecode or the non drop frame timecode as default. This can be set when an exporter to which the alpha channel is retained and can be output to is selected. Select whether to output only the color channel or to output the color channel and the alpha channel. Checking [Change Audio Format] changes the audio format so it is exported with the below-described items. However, if [Export in 16bit/2ch] has been checked the [Channels] and [Sample Format] settings will be fixed. Select the number of channels from the list. If the selected number of channels is fewer than the project setting, the channels will be exported in order from 1ch. Select [2ch] to export a multi-channel project to be used with software of another company. Select a sampling rate from the list. Select an audio quantization bitrate from the list. Select [16bit] to export a multi-channel project to be used with software of another company. Check this item to export the audio part. Check this item to create waveform cache (waveform representation of audio). This can be set when a compatible exporter is selected. Check this item to export with ancillary data (including closed captions) retained. If the frame size, after the frame rate or aspect ratio is corrected, is different from the project settings, ancillary data will be deleted. This can be set when a compatible exporter is selected. Check this item to export with the audio bitstream retained. If the frame size after the frame rate or aspect ratio is corrected is different from the project settings, audio bitstream will be deleted. For the items in the list of the aspect ratio conversion setting to be set in the [Print to File] (Detailed Settings) dialog box, what follows are example descriptions of converting a 16:9 screen to a 4:3 screen, and a 4:3 screen to a 16:9 screen. The 16:9 screen is displayed in the center of a 4:3 screen, and a letter box effect is added above and below. The 4:3 screen is displayed in the center of a 16:9 screen, and side panels are added at the edges. The left and right sides of the 16:9 screen are cropped to fit the 16:9 screen to a 4:3 screen size. The top and bottom parts of the 4:3 screen are cropped to fit the 4:3 screen to a 16:9 screen size. The 16:9 screen is compressed horizontally to fit a 4:3 screen size. The frame aspect ratio is not conserved. The 4:3 screen is stretched horizontally to fit a 16:9 screen size. The frame aspect ratio is not conserved. The 16:9 screen is cropped to a 14:9 or 13:9 screen size, displayed in the center of a 4:3 screen and a letter box effect is added above and below. The 4:3 screen is cropped to a 14:9 or 13:9 screen size, displayed in the center of a 16:9 screen and side panels are added at the edges. The compression format can be selected to export a project as an AVI file. 1Click a codec of [AVI] in the [Print to File] dialog box category tree. 2Select an exporter, and click [Export]. For the items for the Grass Valley HQ AVI and Grass Valley HQX AVI codec settings, see the description given for the [Settings - Grass Valley HQ]/[Settings - Grass Valley HQX] dialog box in [System Settings]. If [Use MSDV codec] is checked when the [DV AVI] exporter has been selected, it will export as AVI with the MSDV codec. 3Set a file name and save destination, and click [Save]. You can export just the audio of a project. If [Dolby Digital Professional (AC-3)] exporter/[Dolby Digital Plus (E-AC-3)] exporter is selected, see Exporting in Dolby Digital Professional or Dolby Digital Plus Format. 1Click [Audio] in the [Print to File] dialog box category tree. To export as Windows Media Audio, click [Windows Media] in the category tree. If the [Dolby Digital (AC-3)] exporter has been selected, select a bitrate from the [Format] list. If the [WindowsMediaAudio] exporter has been selected, select the transfer mode. If [CBR] (fixed transfer mode) has been selected, select a bitrate from the [Bitrate] list. If [VBR (quality based)] (variable transfer mode) has been selected, select a bitrate from the [Quality] list. Projects can be exported as Dolby Digital Professional or Dolby Digital Plus format files. An optional license is required to operate on EDIUS Elite/Pro. On EDIUS where an optional license is added, [Dolby Digital Professional (AC-3)] exporter can be used instead of [Dolby Digital (AC-3)] exporter. As Dolby Digital Professional (AC-3) is compatible with Dolby Digital (AC-3), saved presets can be used as they are. 1 Click [Audio] in the [Print to File] dialog box category tree. 2 Select [Dolby Digital Professional (AC-3)] or [Dolby Digital Plus (E-AC-3)], and click [Export]. Select the number of bits. 3 Set a file name and saving destination, and click [Save]. Output channels are assigned to the front left (L), front right (R), front center (C), LFE, rear left (Ls), and rear right (Rs), in the order of the smallest channel number. (Channels that are not used will be skipped.) When the single rear (S) is to be used, the rear left (Ls) is assigned. Output channel can be set in the channel map of the project setting or sequence setting. Audio set as Ch1 in the sequence settings is encoded as L, and audio set as Ch2 is encoded as R.
*[Yes] indicates that [LFE Channel] in the [Dolby Setting] dialog box is checked. Specify the audio channel (front left (L), front center (C), front right (R), single rear (S) rear left (Ls), rear right (Rs)). Select an option from [1/0] (C only, monaural), [2/0] (L/R, stereo), [2/1] (L/R/S), [2/2] (L/R/Ls/Rs), [3/0] (L/C/R), [3/1] (L/C/R/S), [3/2] (L/C/R/Ls/Rs). The items where the number of channels exceeds the audio channels in the project setting cannot be selected. Check this item to export including LFE channel. When [Audio Coding Mode] is set to [1/0] or [2/0], it cannot be selected. Set Dolby surround or Dolby Digital surround EX. When [Audio Coding Mode] is set to [1/0] or [2/1], it cannot be selected. Can be set when [Audio Coding Mode] is set to [3/0], [3/1], or [3/2]. Dolby surround mode is not specified. Downmix to audio compatible with Dolby surround. Downmix to audio compatible with stereo or monaural playback. Downmix in the Dolby Digital Pro Logic II format. For Dolby Digital Professional, it cannot be set. Select a value to downmix the center channel when the playback device does not have the center channel and stereo playback is to be performed. Selecting [-INF dB] deletes the center channel. Can be set when [Audio Coding Mode] is set to [2/1], [2/2], [3/1], or [3/2]. Select a value to downmix the surround channel when the playback device does not have the surround channel and stereo playback is to be performed. Selecting [-INF dB] deletes the surround channel. Specify the peak sound pressure level (SPL) in the environment where the final mixing has been performed (such as a studio or dubbing stage). Select from [111 dB] to [80 dB]. Specify the average audio level of the bitstream. Specifying this value enables playback of multiple audio with the same level on the playback device. Select from [-31 dB] to [-1 dB]. The difference between the selected value and 31 dB is the attenuation when the audio is played back on a playback device. Select the audio level [-31 dB] from the edited file. Set [-6 dB]. The attenuation will be 31 dB – 6 dB = 25 dB. Set [-12 dB]. The attenuation will be 31 dB – 12 dB = 19 dB. Set the audio service included in the bitstream. Specify the information on the environment where the final mixing has been performed (such as a studio or dubbing stage). Specify the dynamic range compression settings. To use [Dynamic range control profile], configure [Dialog Normalization] properly. Specify the digital conversion process. Check this item to enable the low-pass filter of the LFE channel and to filter audio of 120 Hz or higher. Check this item to output in Dolby surround compatible audio when downmix playback of multi-channel audio is performed on a 2-channel decoder. Check this item to decrease the surround channel by 3 dB when home theater equipment compatible with multi-channel is used. Check this item to specify that the output file contains copyright-protected contents. Check this item to specify that the output file is not a copy but an original file. * If [Audio Coding Mode] is [2/0], [Dolby Surround Mode] is set. If [Audio Coding Mode] is [2/2], [3/0], [3/1], or [3/2], [Dolby Surround Mode EX] is set. You can export in MPEG4 format for playback as a QuickTime movie or in 3GP format for playback on a mobile phone. 1Click [QuickTime] in the [Print to File] dialog box category tree. 2Select [QuickTime], and click [Export]. 3Select a file format from the [Save as type] list, and click [Settings]. [Settings] may be unavailable depending on the file format. 4Configure the export settings, enter a file name and click [Save]. 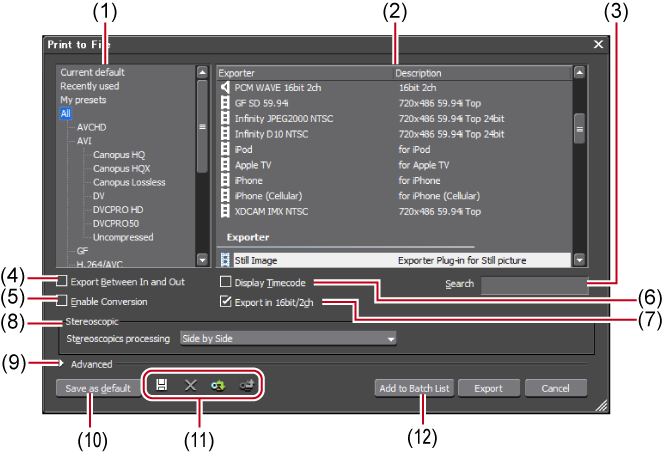 See the QuickTime player help for more information on the detailed settings for each file export. DV streams exported with the [QuickTime] exporter are encoded using an Apple DV codec, and DV streams exported with the [DV stream] exporter are encoded using a Grass Valley DV codec. DV streams encoded with a Grass Valley DV codec support smart rendering. You can export to an MPEG 2 format file (*.m2ts) for BD. 1Click [H.264/AVC] in the [Print to File] dialog box category tree. 2Click [Blu-ray], and click [Export]. The [Blu-ray] dialog box appears. 3After setting the export details, specify a file name and save destination and click [Save]. Set the profile. The selectable profiles will differ dependent on the frame size to be exported. [CBR] assigns a constant number of bits. Although noise, etc. may be present, the encoding process is made quicker. [VBR] changes the assigned bitrate according to the complexity of the movement or image quality. Compared with [CBR], the media volume can be used more efficiently, and this enables more consistent image quality overall. Set this item if [CBR] or [VBR] has been selected as the bitrate type. You can either select from the list or enter values directly. Set this item if [VBR] has been selected as the bitrate type. You can either select from the list or enter values directly. Set this item if [Quality] has been selected as the bitrate type. Select the image quality from the list. Check this item to export using hardware encoding such as Quick Sync Video. It is not displayed when hardware encoding cannot be used. Select the audio compression format from the list. If the number of audio channels in the project settings is 6ch or more, 7ch/8ch are discarded, and output is with 5.1ch - 1ch:L, 2ch:R, 3ch:C, 4ch:LFE, 5ch:Ls, and 6ch:Rs. If the number of audio channels in the project settings is 5ch or lower, all except 1/2ch are discarded and output is with 2ch. If the number of audio channels in the project settings is 8ch, output is with 8ch; if the number is 6ch/7ch, output is with 6ch; if the number is 4ch/5ch, output is with 4ch: and if the number is 3ch, output is with 2ch. Enter the IDR frame interval, and set the GOP size. Set the number of B-frames included in one GOP. Set up to how many frames to consider when motion estimation is performed. Check this item to divide 1 frame into 4 parts. If the decoder supports multi-slicing, the decoding may be made quicker. Select the H.264 encoding mode. Select the unit of division for the motion estimation block from the list. Set the block size during motion estimation for intra-frames/inter-frames. Projects can be exported in MP4 format files (*.mp4). Select one of [H.264/AVC], [PlayStation Portable] or [iPod] as the exporter. For the setting items, see the descriptions given for the [Basic Settings] tab/[Extended Settings] tab in Exporting to a BD Output Format. Projects can be exported as an MPEG2 format file. 1Click [MPEG] in the [Print to File] dialog box category tree. 2Click [MPEG2 Elementary Stream] or [MPEG2 Program Stream], and click [Export]. The [MPEG2 Elementary Stream] dialog box or the [MPEG2 Program Stream] dialog box appears. 3Configure the video and audio settings, specify a file name and save destination and click [Save]. If [MPEG2 Elementary Stream] has been selected, click [Select], set the audio and video export destinations, and click [OK]. The setting items displayed may differ in part depending on the exporter. Select from [Stereo], [Dual Channel] or [Joint Stereo]. [Stereo] is normal stereo that records separately on the left and right sides. If there is a large difference between the left and right audio, compared to stereo that saves audio with a greater focus on one side, [Dual Channel] records totally independently so that there is no bias in sound quality to one side. Select to enter narration in 2 languages, etc. [Joint Stereo] improves audio quality and compression ratio when recording left and right audio separately by automatically using a single channel that combines the audio when the left and right sides are the same or one more channel when the left and right audio are different. Select from the list for high-frequency compensation that saves while emphasizing the high range. With [None], there is no high-frequency compensation. [50/15 us] is an emphasis setting employed by some audio CDs, etc. [CCITT J.17] is a telecommunications standard recommended by CCITT. The “protection_bit” indicates whether redundancy is added to an audio stream in order to make error detection and correction possible. Check this item to change it to “1”, indicating that redundancy is being added. Uncheck this item to change it to “0”, indicating that redundancy is not being added. Check this item to change the “original_copy” bit to “1”, indicating the original copy. If it is unchecked, it becomes “0”, indicating a duplication. Check this item to change the “copyright” bit to “1”, indicating that the copyright is protected. If it is unchecked, it becomes “0”, indicating there is no copyright. Export all frames between In and Out points on the timeline as still image files. 1Click [Other] in the [Print to File] dialog box category tree. 2Click [Still Image], and click [Export]. 3Specify a file name and export destination, and select the export format. A sequential number will be added based on the file name entered. 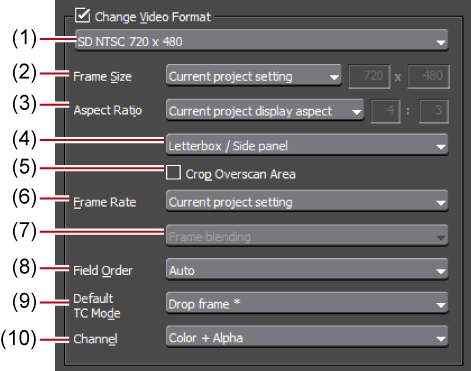 Change the aspect ratio correction or export field settings. The settings for [Still Image] in [System Settings] will be the initial values. For example, if “Still1” is entered as the file name, the exported image files will become “Still1”/“Still2”/“Still3”... and if “Still5” is entered as the file name, the exported image files will become “Still5”/“Still6”/“Still7”..., etc. If a number is not added at the end of the file name, an 8-digit sequential number will be added automatically. 4Click [Save between In/Out in sequential files]. The video is exported as still images. Projects can be exported in F4V format for Flash. 2Click [F4V], and click [Export]. The [F4V] dialog box appears. Check this item to export sequence markers as cue points for Flash. Select the name of the type of cue point. Export is possible with metadata appended. Select an item from the [Name] list, and enter metadata at [Value]. Import XMP format (*.xmp) metadata. This is reflected in the [Metadata] setting. Export the settings made at [Metadata] in XMP format. If “Adobe Flash CS3 Professional” is installed on the PC, you can export a Flash Video. To export a Flash Video, “Adobe Flash CS3 Professional” must be installed on the PC in an environment that can use Adobe Systems Flash Video. Please see the user manuals provided by Adobe Systems regarding “Adobe Flash CS3 Professional” and “Flash Video”. 2Click [QuickTime], and click [Export]. 3Select [FlashVideo (FLV)] in [Save as type]. If you click [Settings], you can set the encoding and change the video size, etc. 4Enter a file name, select the save destination and click [Save]. AVCHD streams can be easily exported to an SD memory card or memory stick. A file can be exported to any desired save destination. If exporting to removable media, make sure to connect the SD memory card or memory stick to the PC before export. If you want to edit a menu, etc. use Disc Burner to write the project to DVD or BD. When exporting to the internal hard disk, internal memory or removable disk of an AVCHD camera for playback on the AVCHD camera, you may be unable to perform the export or playback depending on the camera. You cannot write AVCHD streams from EDIUS directly to a DVD-R or BD. 1Click [AVCHD] in the [Print to File] dialog box category tree. To write to removable media, click [AVCHD Writer] or [AVCHD 3D Writer], and proceed to step 3) . To export to an AVCHD format file without writing to removable media, click [AVCHD] and proceed to step 5. Depending on the type of save destination, a warning message may be displayed saying that data will become unrecognizable. Be sure to create a backup before export, as required. The SD memory card or memory stick connected to the PC will be recognized as an external drive. You can select [Folder] and click [Select] to export an AVCHD stream to a specific location on the PC. 4Select [SD Memory Card] or [Memory Stick / HDD Camera] in [Format]. Select according to the media being used. 5Configure each item in the [Basic Settings] tab and [Extended Settings] tab. For [AVCHD], set a file name and save destination, and click [Save]. If a stream file size exceeds 2 GB, it will be split up before export. Projects can be exported in the 3DA1 format to an SD/SDHC memory card. A file can be exported to any desired save destination. If exporting to an SD/SDHC memory card, make sure to connect the memory card to the PC before export. 2Click [AVCHD (Dual Card 3D) Writer], and click [Export]. 3Set the export destination for the L side and the R side in [Destination 1] and [Destination 2] respectively. To export to a camera, select [Drive], and set the export destination from the list. To export to the hard disk on the PC, select [Folder], and click [Select] to set the export destination. 4Configure each item in the [Basic Settings] tab and [Extended Settings] tab. Projects can be exported to an SxS memory card or an SDHC memory card in the XDCAM EX format. Connect a device to the PC, and check the power is turned on. Files can also be exported to the PC hard disk. You can also export in the XDCAM EX 3D format. Be sure to format the SxS memory card with the XDCAM EX device or a device that supports XDCAM EX 3D in advance. 1Click [XDCAM] in the [Print to File] dialog box category tree. Select either [XDCAM EX], [XDCAM EX DV] or [XDCAM EX 3D] as the exporter. 3Set the export destination, quality, metadata, etc., and click [OK]. The setting items will differ depending on the exporter. If [XDCAM EX] has been selected. Select whether to export to an SxS memory card, to export to an SDHC memory card or to save to a local folder. If [Sony - SxS Memory Card] or [JVC - SDHC Memory Card] is selected, select a card from the list. If [Automatically select the next card when card is full.] is checked, when free space runs out on the SxS memory card selected as the export destination, an SxS memory card with free space will be selected automatically and exported to. If it is unchecked, a dialog box will be displayed to select the export destination. If [Folder] has been selected, click [...] and specify a save destination. Check this item to complete information within each GOP. Although the amount of data increases, the video can be re-edited using software that supports GOP-based editing. Check this item to export the audio as a stereo track. This is only displayed when the audio channel is 2ch. Select an image quality mode (SP or HQ). Add metadata such as title and comments to clips to be exported. If [XDCAM EX 3D] has been selected as the exporter, the operations are subject to the following restrictions. If [Sony - SxS Memory Card] has been selected for [Destination], only memory cards in two slots on the L side can be recognized on the PC due to the specifications of Sony memory camcorder. Insert memory cards into the slots on the L side. After exporting, reinsert the cards into the slots on the R side. If the free space runs out on the export destination drive during an export operation, the [Select Memory Card Drive] dialog box appears. However, when [Destination] is [Folder] or when batch export is being performed, this dialog box does not appear. If [Folder] is selected for [Destination], the export destination for L and R cannot be set to the same location. When exporting has been performed by splitting up the export onto multiple SxS memory cards, the place exported to will be registered in the bin as sequence clips. However, if one of the SxS memory cards is not attached during registration, it will not be registered in the bin. Select the next memory card drive. Click this item after selecting a drive or after replacing a memory card. You can export a project to a GF device. 1Click [GF] in the [Print to File] dialog box category tree. Select either [GF clip], [GF clip(DV)], [GF clip(SD)], [GF clip(DVCPRO25)] or [GF clip(DVCPRO50)] as the exporter. Exporters that do not support the project settings will not be displayed. 3Set the export destination, BIN to export to, clip name, etc., and click [OK]. The configurable items will differ depending on the exporter. If [GF clip] has been selected. Select whether to export to a GF drive or save to a desired PC folder. If [GF Drive] has been selected, select a Drive from the list. If [Folder] has been selected, click [Select] and specify a save destination. Set the BIN in which to register the exported clip. Select from the list, or click [Append], enter a BIN title and register anew to the list. Enter the name of the clip to be exported. Select the GOP type from [I-Frame Only(100 Mbps)] or [Long GOP(50 Mbps)]. Select the number of audio channels. Select an audio quantization bitrate. If a clip consists of a file size that exceeds 4 GB, it will be split up before export. You can export a project to an Infinity device. 1Click [Infinity] in the [Print to File] dialog box category tree. Select either [Infinity DV], [Infinity JPEG2000], [Infinity D10] or [Infinity MPEG] as the exporter. Exporters that do not support the project settings will not be displayed. 3Set the export destination, clip name, playlist name, etc., and click [OK]. If [Infinity MPEG] has been selected. Select whether to export to an Infinity drive or save to a desired PC folder. If [Infinity Drive] has been selected, select a Drive from the list. Select whether the playlist name has the same name as the clip name. If [Specified the playlist.] has been selected, enter a playlist name. Select an audio quantization bitrate and a number of audio channels from the list. You can export a project to a P2 card. Make sure that the P2 device drivers are already installed. Audio will be exported in 16-bit format audio, even if the project preset is set to 24-bit format audio. 1Click [P2] in the [Print to File] dialog box category tree. Select one of [P2 Clip], [HD P2 Clip], [HD P2 3D Clip] or [AVCUltra P2 Clip] as the exporter. Exporters that do not support the project settings will not be displayed. If a P2 card is not connected to the PC, the [Browse For Folder] dialog box will appear. Specify a file export destination and click [OK]. , etc., and click [OK]. Metadata, such as the created by and capture information, can be imported from another P2 clip. Click [Load Metadata] and select the XML file to be imported. If there is no more free space in the export destination, or if the clip consists of a file size that exceeds 4 GB, it will be split up before export. If [Automatically select the next card when card is full.] is checked, when the clip is split, a P2 card drive that has free space will be selected automatically and exported to. If it is unchecked, when the clip is split, a dialog box will appear to select the export destination. If exporting at 720p, the export frames must be even frames. If a confirmation message appears, select a processing method. If a DVCPRO HD export format and the settings content for an EDIUS project preset differ, the export data will be stretched before export so that the frame rate and the field order correspond to each other. With the XDCAM exporter you can output a project as an MXF file, and upload it to an XDCAM device or FTP server. MXF files can also be exported to the PC hard disk. Files can also be exported to the XDCAM Memory drive (SxS memory card formatted with an XDCAM device). To export to an FTP server, have the connection destination set in advance in system settings. Be sure to format the SxS memory card with an XDCAM device in advance. Files cannot be exported to an SxS memory card formatted in the XDCAM EX format. Proxy files will not be exported. Select from [XDCAM DV], [XDCAM HD], [XDCAM HD 422], [XDCAM HD 720P] or [XDCAM MPEG IMX] for the project image size. 3Set the export destination, clip name, etc., and click [OK]. If [XDCAM HD] has been selected. Select whether to export to an XDCAM drive, to an FTP server, or to the desired folder on the PC. If [XDCAM Drive] was selected, select a Drive from the list. If [FTP] was selected, check the server to be exported to and, as necessary, check the item described below. If [Folder] was selected, click [Select] and specify a save destination. Check this item to export a temporary file to the project folder, and then upload the actual data to an FTP server. After outputting the temporary file, if an error occurs during transfer to the FTP server or if the upload is aborted, the temporary file will not be deleted. Set the file name to be exported. If [Folder] is selected as the export destination, enter a clip name. Check this item not to use the B-picture at the GOP border as reference across GOPs. Although the amount of data increases, the video can be re-edited using software that supports GOP-based editing, as the information is completed within each GOP. Select the audio format to export. If a clip is exported that does not include high-resolution or proxy data, a dialog box will appear to set the processing before export. Select a processing method and click [OK]. If [XDCAM MPEG IMX] was selected, 3 lines (black) will be added above and below the 720×480 video to be exported as Even (Top Field First). Also, 720×576 (Odd) video will be shifted by 1 line to be exported as Even (Top Field First). If uploading an MXF file to an FTP server that has once been exported to a folder on a PC, use the source browser. Click the XDCAM tree in the source browser, right-click the FTP connection destination and click [Upload]. Select an MXF file, and click [Open]. You can export a project to an XQD memory card in the XAVC S format. Connect a device to the PC, and check that the power is turned on. Be sure to format the XQD memory card with an XAVC S device in advance. 1Click [XAVC] in the [Print to File] dialog box category tree. 2Select [XAVC S] for the exporter, and click [Export]. Select whether to export to an XAVC S device or to a desired PC folder. If [Memory Card] has been selected, select a device from the list. If [Folder] has been selected, click [Browse] and specify a save destination. Select the bitrate and image quality of the video to be exported. Select the audio format of the video to be exported. With the XAVC exporter, you can export a project, and upload it to an XDCAM device or FTP server. To export to an FTP server, configure the setting of the connection destination in advance in system settings. 1 Click [XAVC] in the [Print to File] dialog box category tree. 2 Click [XAVC], and click [Export]. 3 Set the export destination, clip name, etc., and click [OK]. Check this item to export a temporary file to the project folder, and then upload the actual data to an FTP server. After exporting the temporary file, if an error occurs during transfer to the FTP server or if the upload is aborted, the temporary file will not be deleted. Select the format to export. Select the quality to export. Select the audio channels to export. You can export a project in the CMF or GXF format employed by K2. 1Click [K2] in the [Print to File] dialog box category tree. The output settings dialog box appears. The setting items will differ depending on the exporter. If [MPEG2 GXF] has been selected. Enter the name of the clip (file) to be exported. Select whether to export to a desired PC folder or to an FTP server. If [FTP] was selected, check the server to be exported to and, as necessary, check the items described below. Check this item to overwrite a file if the file with the same file name is present at the FTP server of the export destination. Check this item to export a temporary file to the project folder, and then upload the actual data to an FTP server. After outputting the temporary file, if an error occurs during transfer to the FTP server or if the upload is aborted, the temporary file will remain undeleted. When this item is unchecked, export will take place with the “*.gxf” file extension added if the name entered in [Clip Name] does not include the file extension. Becomes enabled if [Upload to FTP after exporting file] is unchecked. If it is checked and export is aborted, the file created up to the time point of the abort will remain at the export destination. [CBR] sets a fixed transfer rate, allocating a fixed number of bits during the encoding process. Enter an average bitrate in [Average]. [VBR] sets a variable transfer rate, altering the number of assigned bits according to the complexity of the movement or image quality. Enter the average bitrate in [Average], and maximum bitrate in [Max]. The field order can be selected if it is in SD format. Select I, P and B frame patterns of the GOP from the list. Normally, select [IBBP]. Enter the number of frames included in 1 GOP. If it is checked, the GOP will be closed. Although the amount of data increases, the video can be re-edited using software that supports GOP-based editing, as the information is completed within each GOP. Normally, leave this item unchecked. Select the number of audio channels you want to export from the list. [Current setting] is the number of channels configured in the project settings. If [Enable Conversion] is checked for the exporter and the number of channels for the audio format is changed from the project settings, the number of channels will be the number set here. Select the number of bits to be used during sampling. [Current setting] is the number of bits configured in the project settings. 3Configure the export and click [OK]. You can export to MXF, a video file format used in industry for server transfer, etc. 1Click [MXF] in the [Print to File] dialog box category tree. If [MPEG2 MXF] has been selected. Check this item to overwrite a file if the file with the same file name is present at the server of the export destination. Uncheck this item to display a confirmation message. Uncheck this item to export a file with the “*.mxf” added if the name entered in [Clip Name] does not include the file extension. When this item is checked, the file being uploaded will be completed if an upload is aborted. Select the number of bits to be used during sampling from the list. [Current setting] is the number of bits configured in the project settings. Specify the number of channels to be included in 1 audio track for MXF. Select a system item format. Select a KAG (KLV Alignment Grid) size. Projects created in the stereoscopic edit mode can be exported to file. Export the data of the L and R sides of the project to a file. 1Select an exporter in the category tree in the [Print to File] dialog box. 2Select one of [L/R Dual Stream], [Left only], [Right only], [Side by Side], [Top and Bottom], [Line Interleave], [Blend], [Anaglyph], or [Difference] from the [Stereoscopic] list. [Side by Side]/[Top and Bottom]/[Line Interleave]/[Blend]/[Anaglyph]/[Difference] combine and export the video of the L and R sides to a single file. 4Set the export contents, and click [Save] or [OK]. The export contents differ depending on the exporter. See the explanation for the respective exporter. You can output the video of the L and R sides separately to two different files. 2Select [Separate Left and Right] from the [Stereoscopic] list. The export settings screen appears. 4Set a file name and export destination for the L and R sides. 5Set the export details in the dialog box in step 4. The export details differ depending on the exporter. See the explanation for the respective exporter. Click [Browse], and specify save destination. The files for the L and R sides are saved to the same folder. Set the suffix of the file name for the L and R sides. Click [Browse], and specify each export destination for the files for the L and R sides.